A friend of mine’s birthday was in July, meaning I had a legitimate reason to craft and such. There were so many things I wanted to make, but I decided on one big thing and two little things for her that I think she’ll enjoy. I thoroughly enjoyed making this particular thing, and I think it’s beyond adorable. Now it just needs a name, and I’m going to let my friend have the honors. I’m super sad that I didn’t have any brown yarn to make chocolate cupcakes, but my going out to get some would mean that I would buy a lot more than I planned because once I see a place that sells yarn, I can’t just buy one skein or one color. But I’m going to have to go into P & S Fabrics eventually, and given its extremely close proximity to my dorm, I might as well get it over with. 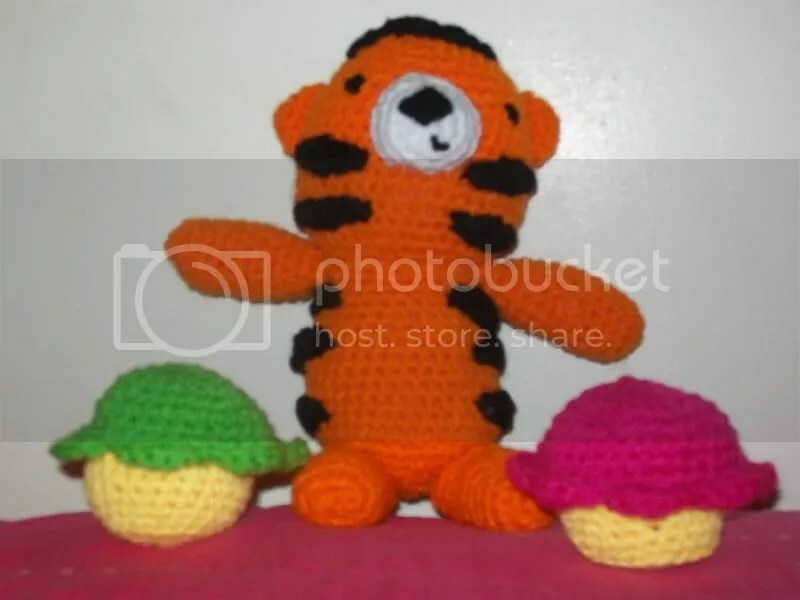 EDIT: I presented my friend with her presents, and she promptly named the tiger "El Tigre" and commented on the "comb-over effect" of the stripes on his head. I totally didn’t even notice that when I was sewing on the stripes, but it really does look like that, although I have to say it suits him. He and his comb-over are now perched on her windowsill watching over her room when she’s gone. I’m sad to see him go, since he’s the first thing amigurumi that I’ve made and given away, but I know I’ll be seeing him all the time when I’m visiting my friend.